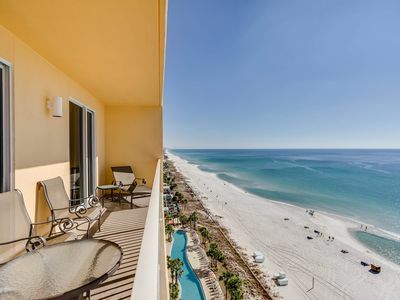 New Listing*Redecorated 1 BR Gulf Front* Beach Svc Included! 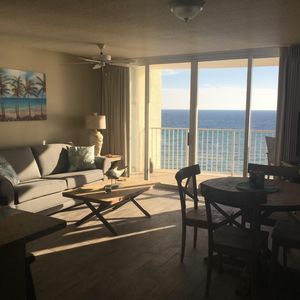 Beachfront one bedroom condo, wide balcony with direct gulf front view that can’t be beat and comfy lounge chairs, newly REDECORATED, seasonal beach lounge chair rental included. Walk to restaurants and bars! 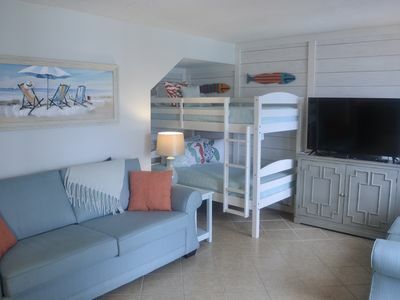 Fully equipped kitchen, bunks in the hall, sleeper sofa in the living room. ESCAPE to Emerald Surf Escape! I spent 25 years working, living and developing a passion for this beach and all it has to offer, before I moved back to the Pacific Northwest for family reasons. 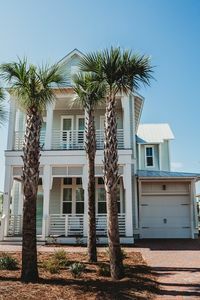 I bought my first rental condo in 2017, and started looking for another to buy with my son, a born and raised Panama City Beach local. We found just what we were looking for at the Summit! 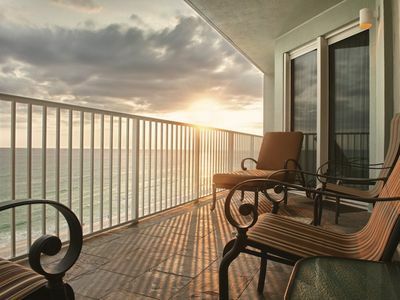 Our 8th floor, one bedroom condo is beachfront, with a balcony that can’t be beat (sunset on the balcony with wine? 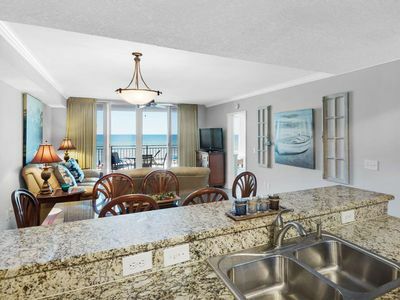 ), great amenities - 2 swimming pools, hot tub, direct beach access, Bikini Bob's Tiki Bar (in season), gift shop/snack bar, game room, fitness center, and location close to our favorite restaurants, bars and shops - walking distance to many! 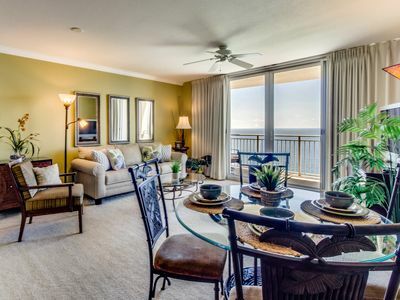 Easy access to Pier Park, the best shopping, the best golf courses, and the best restaurants! 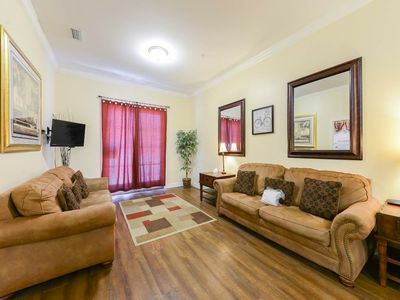 We completely redecorated with cool relaxing colors, new furniture, and gel memory foam mattress toppers, in the Summer of 2018. We upgraded to a large cultured marble shower in 2019 - all brand new! 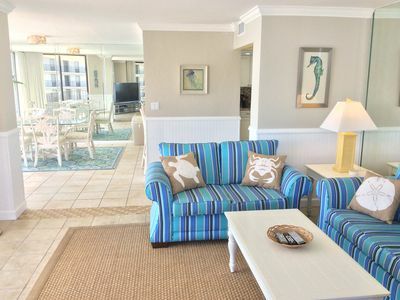 Rental of 2 cushioned chaise beach lounge chairs are included March - October ($35 per day value). Our condo will sleep 6 with a queen size bed in the bedroom, 2 twin bunks in the hall, and a new sleeper sofa with queen serta mattress. One and a half baths - 2 sink/mirror areas, 2 toilets and a shower. Well out-fitted kitchen for cooking during your stay. 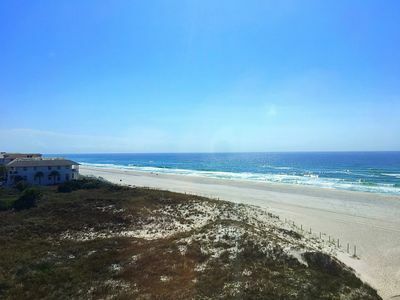 Washer and dryer in the unit, along with everything you need for the beach (beach towels, sand toys, beach chairs, beach cart, and cooler). 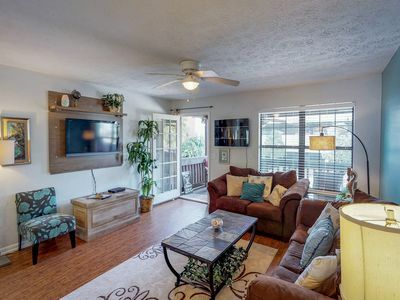 Comfortable balcony furniture (bistro dining set and 2 lounge chairs will have you spending hours on the balcony), 55 inch flat screen TV with DVD player and comfy couch. We are music lovers so hope you enjoy the Harman Kardon wireless speakers as much as we do! Instead of a used bedspread you will enjoy a freshly laundered duvet cover. Be sure and review our “locals book” when you arrive – full of hints, tips and personal recommendations. We are always available to answer your questions and have a trusted local point of contact to help you with any issues that arise during your stay. Note: $17 one time fee required at resort front desk checkin for parking pass and wrist bands. 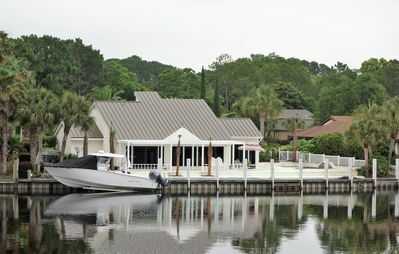 Village of South Walton H189 - Book your spring getaway! 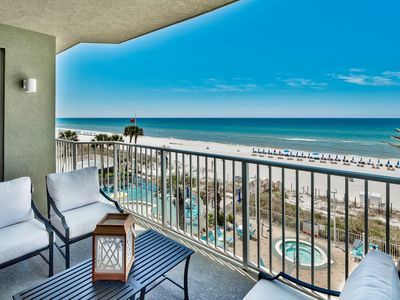 Palazzo 1003 - Don’t miss your spring vacation. Book now! 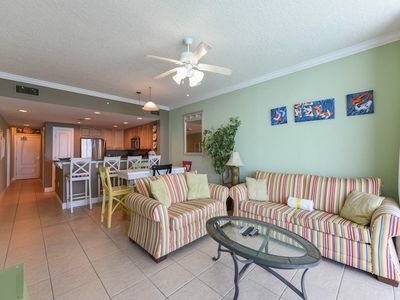 BEAUTIFUL CONDO @ Calypso! 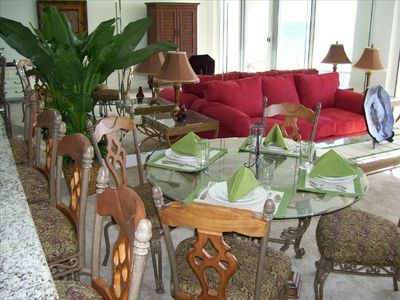 *APRIL 21 - 25th LAST MIN SPECIAL $129/NT! 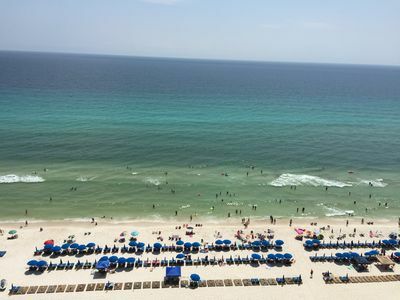 Specials Avail...call 404-451-2559 Beach chair rental included! 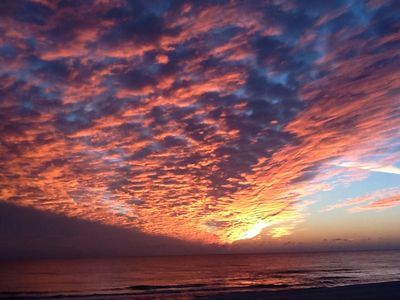 Amazing Gulf View Condo * Pool *Free WiFi* Free Parking *Beach Equipment. June & July Dates Available! 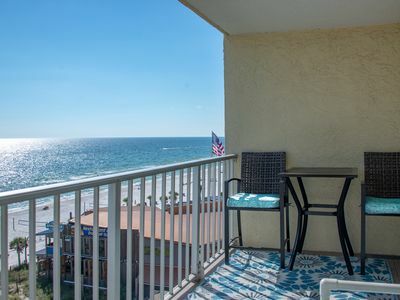 Boardwalk Beachfront, 3rd Floor! Best View at Boardwalk! Newly Remodeled 2019! 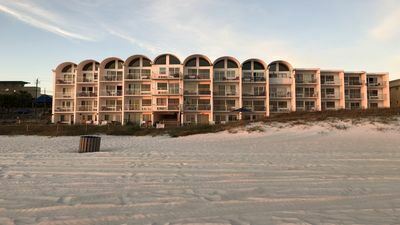 Building sits right on the beach, no streets to cross! 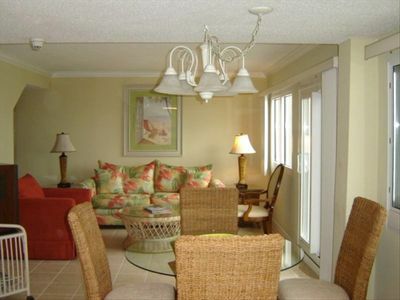 Bright and comfortable townhouse - close to restaurants and the beach - dogs OK! 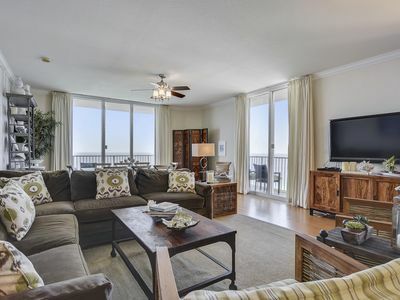 Luxurious penthouse on the west end of the beach with desirable floor plan!